Finally got those bulletin boards finished- well, almost. I still have a few touches to add, but they are 99% finished. This one is to help the kids with clean up and organization. I told them that I am the biggest monster at the top and they are the smaller monsters at the bottom. If you recall, I have their tables numbered, so they know which monster is "theirs" (see photo below). I have made it so that I can remove the word clouds and replace them with new jobs each day. Basically, their monster tells them what to do at clean-up time. Jobs include sharpening pencils, washing paint brushes, wiping tables, etc. These numbers, on their tables, correspond with their seats and let them know which monster to look at. This is my version of Mr. E's No No Board, which reminds students of things I do not want to see in their artwork. For example, no stick people, no smiley faces on their suns, no "broccoli trees", and no floating people and things. I still need to finish coloring the cards, so this one is a work in progress. I made these signs last year to show my art room rules. This bulletin board is for Artist Spotlights, and obviously, this month's is Vincent VanGogh. My husband knows that I like to start the year with a sunflower project, so he sent me some flowers for inspiration! They look gorgeous on my desk. Hope you are all having a great start to the school year! Wow, you are so organized! I'm jealous of your bulletin board space. We have one bulletin board in our room, boo! It is all cute! I love the monsters! This is my first visit to your blog but I had to comment on your beau-t-ful bulletin boards!!! I love them. I hope you have a wonderful school year. love your "no no" board. i have something similar...and it says "no triangle noses, straight-line mouths, and polka dot eyes!!!" Jan, that is fine. Thank you for the link back! I was just hired as the art teacher after spending my first year as art on a cart in 10 schools. I love your bulletin board ideas. What do your job monsters say? How is your behavior chart working? I teach at two very difficult elementary schools and have tried everything under the sun for classroom management except for your idea. Love your Monster classroom jobs board. 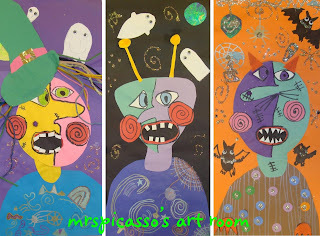 Did you draw your monsters are did you have a pattern? I would love to have them because I am doing a monster theme in my room this year. Vixen, yes, I did make those myself! You are welcome to take inspiration from them to make your own. Have fun! I have just recently discovered your blog and it is amazing! I am currently obsessed with your bulletin board ideas, and am going to try one myself soon. Thank you for your inspiration and dedication!